North, an Amazon backed startup company that was once known as Thalmic Labs, is going to launch a pair of smartglasses later this year. Called Focals, the glasses use a hidden holographic display to show information on the lenses that floats in front of you. Unlike Google Glass, which had a design that practically screamed its name, Focals look like regular eyewear and can be used with prescription lenses. Focals offer turn-by-turn GPS navigation, and come with Alexa built in. This way, you can get the latest news, see an updated weather forecast, order an Uber, control your smart appliances, and much more. You can also stay in touch with friends and family by sending text messages using Focal's voice to text capabilities. The smartglasses also include a calendar so that you can be reminded about certain events and appointments. To help you interact with Focals, the user wears a small rubber ring called Loop, which features a 4-directional joystick that can also be clicked. The case that comes with the glasses automatically charges its battery multiple times before requiring a charge itself. The glasses work with iOS and Android handsets, linking to a phone through Bluetooth. To get fit for Focals, you will need to visit a North Showroom. Two are opening next month, one in Brooklyn at 178 Court Street, and one in Toronto at 113 Ossington Avenue. At the showroom, your Focals will be custom fit to your face. You can still reserve a unit even if you don't live near either city. All you need to do is visit the Focals website by tapping on the sourcelink. Focals are priced at $999 USD ($1299 CAD) and a pair can be reserved with a deposit of $100 U.S. or Canadian Dollars. The balance is due when you visit a North Showroom. The Focals Classic, with an angular frame, will start shipping in December. Next year, the round framed version of the device will be available. 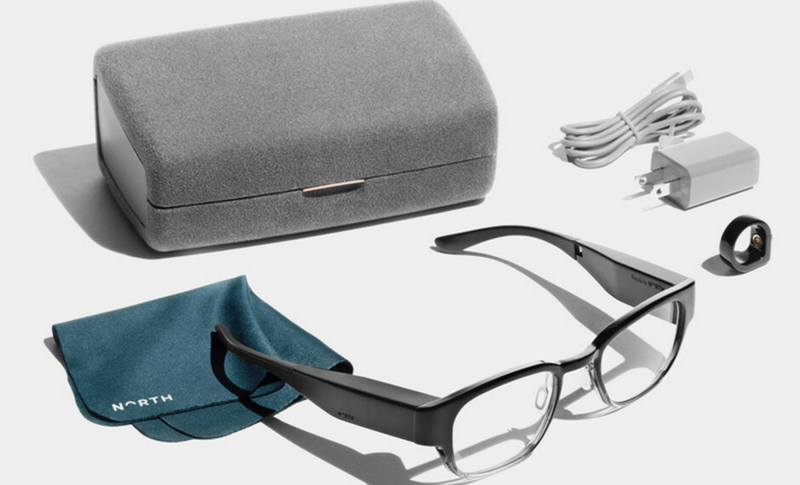 Each Focals order comes with the Loop, sun clips, battery case, cleaning cloth, wall plug and a 3 ft. USB-C cable. For more on the smartglasses, click on the video at the top of this article. This year? There’s only two months left. I think there’d be an announcement by now.